What's New In Tech And Real Estate? If you have iOS 6 you have native panorama photo capabilities, but if you are holding out doing the upgrade or have no intention of doing it, DMD is a remarkable app for taking panorama pictures on your iPhone. Once you open the app and click start, all you have to do is hold your device steady while rotating to the right until the yin-yang icons at the top of the screen touch, then continue on repeating the process until your photo is done and click finish. Magically DMD renders the panorama and starts auto panning the results. You can then share your photo to Facebook, Twitter, e-mail, or save it to the cloud on DMD's site. The best part is DMD is free for a limited time. Hurry and get it, you won't be disappointed. David Bach, the author of the "Finish Rich" series of personal finance books has written a nice article describing how he recommends finding a great Realtor. He has been a Realtor and worked with many while buying and selling his own properties. I have read a number of his books and like what he has to say. He always gives good advice. Here is the link to his blog article about hiring a Realtor. What Is Within Walking Distance? If one of the parameters for finding a place to live is being close to shopping or theaters or parks, this is the app for you. It scores potential neighborhoods for their 'walk score'. That is, what is within walking distance from your home. 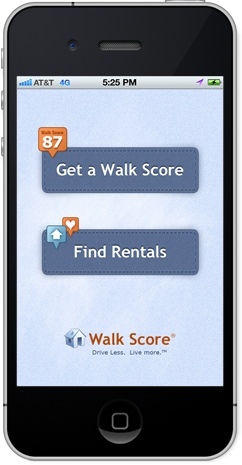 Simply, it's called Walk Score (free). 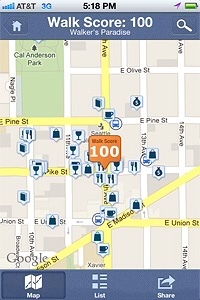 All you have to do is type in an address and you will be directed to a map with a flag marking the spot with a rating from 0-100 indicating the walkability of that location. It will also put markers on the map showing locations of restaurants, coffee houses, groceries, shopping, schools, parks, book stores, bars and entertainment, plus more. So within minutes you can tell if your children's school is within walking distance and if the park to walk your dog is nearby. Now if that wasn't enough to run and download the app, listen to this. 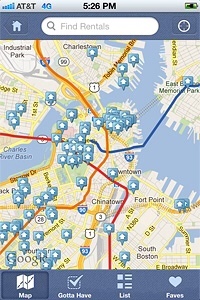 You can also search for rental properties from within the app. Type in a city and will be provided with every rental listed on Craigslist for that location.....along with its walk score. Just tap on a flag, and you will get a description of the apartment, rent amount, directions so you can drive by it and a link to view it directly on Craigslist. This is an amazing app at an amazing price - free. Newton, How I miss you. [caption id="" align="alignleft" width="180" caption="Two Apple mobile devices based on ARM processors. 162MHz on the Newton, 412MHz on the iPhone. (Photo credit: Wikipedia)"] [/caption] Twenty years ahead of it's time. My old best friend Newton gets looked at fresh again. This was the beginning of handheld computing. Watching the videos, I still miss the handwriting recognition. Newton created a new paradigm. I was so mad at Steve Jobs when he came back and killed it, but now I realize it was too expensive and didn't sell well enough to keep. The iPad and iPhone are the proud offspring . I am guilty. Guilty of a pervasive behavior in the mobile world........Loading an app onto my iPhone or iPad and then forgetting about it or not using it all that much. My story is that I use Dropbox for storing and transferring documents via the cloud and thought of Evernote as an app that did pretty much the same thing. And it does, but actually, it has far greater abilities. Here is a video by a business consultant named Spencer Reynolds that does a very good job of explaining what's possible with Evernote. What is most amazing about Evernote is its search capabilities. It uses optical character recognition technology, which simply put, allows it to recognize handwriting. So a word can be found even in a handwritten note. I don't have to worry about filing my note into a folder right away if I am in a hurry, a simple search will retrieve it. I am now cataloging client files and setting up presentations as well as keeping track of receipts and hand written notes. I have finally seen the awesome capabilities that are now at my fingertips. I became sold on handheld PDA's, as they were called back then, during the reign of Palm. The best aspect of the platform, from my opinion was the way contacts, calendars, and notes were all in one application. I could set an appointment with a colleague in a matter of moments. Then when I clicked on the appointment, my colleagues name was linked to the contact portion, so that I could click on their name and get all their contact info. I miss that. So far there are not comparable options on the iOS platform. There are a couple of apps that come very close, but none has hit the mark yet. The one that I use daily is Pocket Informant. I have it loaded on my iPhone and on my iPad, and they sync between one another through the cloud. It keeps track of my calendar, contacts, notes and todo's within the app. It has all the things you look for in a calendar app. Yearly, monthly, weekly, daily and list views. I can access my contacts but unfortunately can only add them to an appointment by inviting them to it. They then receive an e-mail reminder, which actually is a nice feature in itself. There are a multitude of ways to organize tasks (todo's).... in folders, with tags, assigning contexts or starring them. Tasks are tracked based on the due date you set when entering it, so you are alerted if tasks are overdue or nearing that point. I have been thinking about what question I get asked the most when talking about my iPhone and iPad. That question is "what apps do you like most?" or "Whaddyagot that's new?" So I thought I'd start highlighting apps that I have on my iPhone and iPad.....they total about 220. Don't worry, I most likely won't get to all of them but, will highlight the ones I use most to begin with. If I pick the the app I use the most, it would have to be Mail. I have three e-mail addresses that I use and bring them all into the app. Generally I check all inboxes at once to see what's newest. But if I am looking for mail from work, I open just that mailbox to find what I'm looking for. I create rules on my desktop that helps organize mail as it comes in, but can manually move mail to folders on my iPad or iPhone on the fly. The other thing I love about the mail app on iPhone and iPad is the ability to click the edit button to mark multiple e-mails for deletion, not to mention being able to just swipe left on a message to delete. I know I can shift-click multiple e-mails in mail on my desktop, but it's not quite as elegant. I also love that I can e-mail with ease from my devices. I can send photos or other attachments while away from my desktop. Basically, with regards to staying in touch, I don't miss a beat just because I am away from the office or home. I love that! Should I Update My Kitchen? Think about it.....you walk into a prospective home you might want to buy. The outside looks nice, grounds are well kept, you walk through the front door and like the way the house feels. Then you walk into the kitchen and it has orange countertops and appliances straight from the 50's. You think to yourself that you could break out your floral smock so you would fit in with the decor or redo the kitchen. Everything you were feeling about how nice the home was have just gone through the floor. Sure you could renovate the kitchen, but unless the home is $50-60,000 below market value, you know you'll be living with the kitchen from "Happy Days" for some time. I know that kitchens are really not the end all, be all, but the vast majority of buyers I have worked with will walk away from a home with a 'dated' kitchen. It just seems too daunting to think about doing the upgrade with the mess and inconvenience that is sure to accompany the upgrade. Think about it, the current owners haven't upgraded probably for the exact same reason. Look at the paint. Is it in need of a new coat or just a good cleaning? Should you add some style by changing the color? Look at the cabinets. Can you get by with changing the hardware? How about swapping out the doors for updated ones. This often times will make cabinets look new. Look at the lighting. What if you added some track lighting to lighten up the dark areas? Maybe swapping out old fixtures for newer ones will do the trick. Look at the appliances. Which ones could use replacement. These can be the more expensive upgrades, but can also save money in the long run because newer appliances are much more energy efficient. Not to mention you may be able to get rebates for upgrading. Check with your suppliers. Although it is not technically an appliance, a new sink dresses up a kitchen even if the countertops are dated. Look at the countertops. That brings us to the orange countertops......not much you can do short of replacing them. There are so many options you have to shop around. This upgrade is going to be the messiest of them all and has the potential of being the most expensive, short of full appliance replacement. But if you have orange, they need changing....sorry. A few weeks ago I wrote about the Cost vs. Value Report in Remodeling Magazine. Kitchens don't rate at the top of the list, but almost. For a minor kitchen remodel, basically what I've been talking about, you can recoup 71% of your investment. Not bad for the very high emotional return on your investment. By all reports, the real estate market appears to be on a rebound. No telling how fast or how robust the recovery will be, yet it's good news just the same. This means a couple of things. If you are in the market to buy a new home, the values will most likely keep rising, so buying sooner may get you a better deal. Also, if you already own a home and plan on staying put, upgrades you do will only continue to add to your ultimate value. And if you are looking to sell your home, there are some upgrades that will be better at getting you the best return on your investment. Every year, Remodeling Magazine prints a Cost vs. Value report which breaks down the variety of home improvements that rate highest in return. If you go to their website, you can zero in on your actual state and city...or one close to you. Here in Vermont, Burlington happens to be the only city rated, but it still gives a good reference point. Is Your Measuring Tape Lying? I always thought I could trust my tape measures. It turns out, maybe not so much. Fine Homebuilding.com has a video that shows not only how to check to see if your tape measure is the same as another, but also how to easily adjust it. All those times I thought it was me......probably still was. Here's a blog for you that I just found that has everything you will need to know about how to unclutter your space. Just a few minutes on the blog and I picked up at least 5 great ideas that made me go "why did'nt I think of that before?". It's called Unclutterer.com. It has ideas for your desk, closets, garage, workshop......go get organized, I am. Here is a monthly newsletter that I publish that includes usually 4 additional and useful links in it. I know, it's shameless self promotion.....sort of. But I thought you'd appreciate some of the links, and quite frankly it is a bit quicker to give you 4 for the price (time) of one. Enjoy, and if you would like to receive the newsletter via e-mail, let me know and I will add you to the list. here is a place to see what your return on investment will likely be...... determined by state. ....So if your roof needs replacement, and you are thinking about selling soon, the average replacement cost in Burlington Vt. is $20,307 and you can expect to get back 69.3% or $14,065. So why not leave the roof and offer back $15,000 for a roof and save yourself $5,000? I think it is only fitting that my first post of 2008 is a reminder of a premier site for finding out about our great state. As a Realtor, I am always trying to make sure my clients get the information required to know the neighborhoods they are interested in. I have rafts of info, but Virtual Vermont has more than I could catalog. It's a site that is easy to navigate, easy to understand and one of those places you can spend hours on just poking around learning about Vermont. Learn about demographics, places to shop, places to eat, places of worship, links to maps, hotels....just about anything you'd want to know about almost every town. I highly recommend making a stop over, don't forget your coffee because you'll be there a while. Here is a site that will help you in the uncharted waters of gift donations at the holidays and even the rest of the year. You can look up your favorite charity and find out how much of the money raised actually goes to the cause and how much goes to expenses. You will also be able to determine who is paid and what they are paid. There is also a number of lists, such as the Top 10 charities that are not living up to their mission. I looked up a couple of charities that I have been giving to and probably will stop and move the donations to other organizations based on the info I found out. Great site with hoards of information. I just found this site that is a project of the Eco Center which has a very extensive list of toys and the levels of toxins found in them. Now is the season we all go to the mall to buy gifts for our kids, nephews, nieces and grandchildren......let's check out what's in those presents before we buy them and have a healthy holiday. Here is a show that is definitely worth a listen. It's called On The House With The Carey Brothers. You may have heard them on your local Public Radio Station. Not only are they entertaining, but they are the knowledgeable neighbor you wish you had. You know the guy you could just drop in on and ask about the problem of the day. They solve problems on the air, take call ins, and dispense tips galore. I always come away with a new nugget.....but of course I love stuff like that. You can even download their show as a podcast if you want to listen to them on your time schedule....that's actually the way I listen. Give them a try I think you'll like them too. Here is my favorite browser for a couple of reasons. First and foremost is, that it's not Internet Explorer. Why would you want to use the browser that is MOST vulnerable to viruses?....has always been and continues to be. Next, Firefox plays with both PC's and Macs. I like that because I do both, but we know by now my preference is the latter. But the real major reason is because of all the addons that you can get for free. The one that's the reason I won't be leaving Firefox in this lifetime is an addon called Foxmarks. It keeps all my bookmarks current across all my computers. So, all my bookmarks on my PC at the office are the same as the bookmarks on my Macs at home. If I bookmark something new on the PC, all I have to do is 'foxmark' it, sync when I get on the Mac and bingo, everything is the same in my browsers. It is the major life saver in keeping track of all the links I have and share on this blog. Plus I can categorize them any way I want too. It used to be I'd bookmark something at home and have to e-mail the link to myself and then add it at work, or vice versa. Ok, so if those reasons don't get you to download and switch to Firefox, and you still want to keep bookmarks on the web in one place (ie. you still want to use IE), there is Backflip. This is a web based program, free of course, that will allow you to transfer or load bookmarks so that you can retrieve them on whatever computer you are on, as long as you have internet access. Give it a try. It takes a few more steps but it works very well. You can even add a button to your title bar that will automatically place the current webpage onto your backflip page. Look for the 'Backflip It' button.